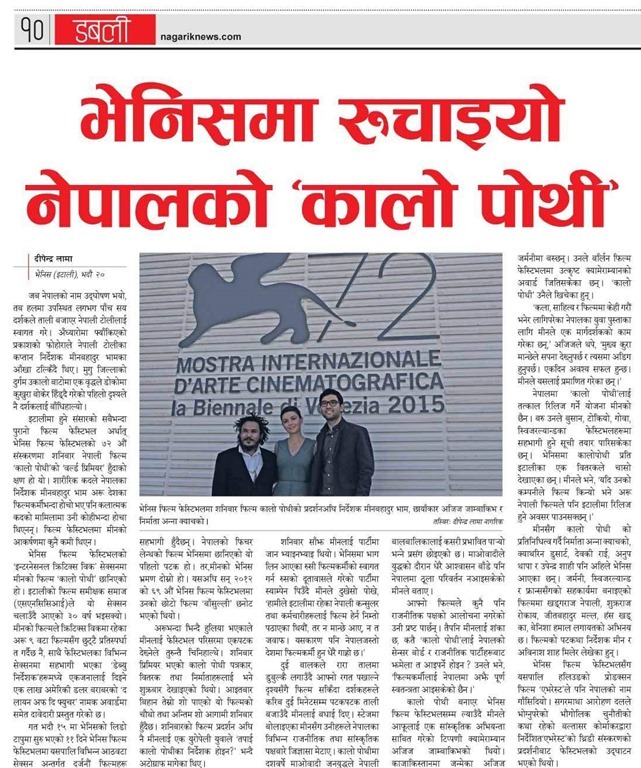 Nepali movie ‘Kalo Pothi’ (The Black Hen) was premiered in a Venice Film Festival in Italy on September 5, 2015. To be premiered in the festival, considered to be one of the oldest film festivals in the world, is an honor to the Nepali film. This year’s Venice Film Festival is the 72nd edition of the festival. The movie ‘Kalo Pothi’, a story of two kids during the hardship of Maoist civil war in Nepal, is 1 hour and 30 minutes long. The movie however doesn’t support any political views. The movie mostly shot in Mugu featues Khadka Raj Nepali, Benisha Hamal and Sukra Raj Rokaya. The director, Min Bahadur Bham, says that he has no immediate plans to release the movie in Nepal. The movie was produced in collaboration of the producers from Germany, Switzerland and France. The cinematographer Aziz Zhambakiyev had previously won an award on cinematography in Berlin Film Festival. The movie was selected to be featured in the International Critic Week section of Venice Film Festival. The movie will compete with nine other movies in the section. This is the first time a feature-length Nepali movie has been selected in the festival. In 2012 Nepali short film ‘Basulli’ was selected to be featured in the 69th edition of the festival. The 11-days-long festival is being held at Lido Island, Italy. Last year, the script of the movie had won Rs. 5.5 million cash prize. The movie is also going to be featured in Busan Film Festival in October. Other festivals the movie is going to be featured include film festivals in Tokyo, Goa and Switzerland. This entry was posted in Event, Movie News and tagged Basulli, Benisha Hamal, Kalo Pothi, Min Bahadur Bham, Premier, Venice Film Festival. Bookmark the permalink.